Welcome to Getting Started with Artisan 5. This course includes everything you need to know to get started using Artisan 5, the best ever digital scrapbooking software. Your pixels2Pages team will put the FUN in the fundamentals of digital scrapbooking. This course will build your confidence so you can begin exploring all of what Artisan has to offer. Before you know it, you’ll be creating pages like a pro! Short videos which show you the essentials of using Artisan 5. PDF handouts with detailed instructions that you can print for easy reference. Some special edition p2P Bright Ideas giving you step-by-step guides for creating pages. Sample Blueprints (page templates) to give you a head start with your pages. Bonus Pixie Power Minute videos (under 2 minutes each) that answer basic questions about using Artisan 5. 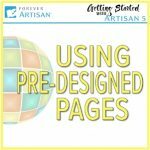 A good place to start is with this lesson about using pre-designed pages; from there you can use the arrows at the bottom of the post to continue learning more about Artisan 5. Click the image below to dive right in – but please finish reading the rest of this page before you do! A reference you will want to have is our Getting Started with Artisan 5 e-book. Feel free to print it, make notes in it, and refer back to it as needed.